Tax Hardship Center is a highly accredited tax resolution company that assists both individuals and businesses with IRS and state tax issues. They offer a wide variety of services, including tax audits, liens, back taxes, unfiled tax returns, and more. Since 2012, Tax Hardship Center has offered both individuals and businesses assistance with resolving IRS and state tax problems. They strive to provide aggressive & ethical tax representation for their clients. Tax Hardship Center is known for negotiating tax debt reduction settlements to the lowest amount possible. Their California-based business provides nationwide assistance with a variety of tax relief services, in addition to tax debt reduction programs they also provide audit defense, tax lien help, back tax filings, bank levy reversals, payroll tax negotiations, and more. 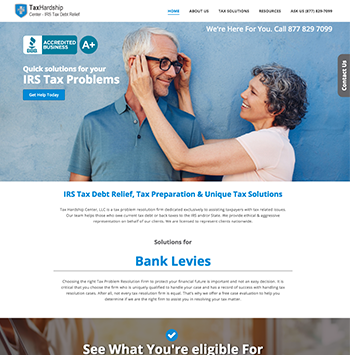 Highly accredited tax relief company: Tax Hardship Center is an A+ BBB accredited business and a member of the American Society of Tax Problem Solvers (ASTPS) and National Association of Enrolled Agents (NAEA). Exceptionally positive customer feedback: Tax Hardship Center has a perfect 5 out of 5 rating on Yelp and other credible review websites. Nationwide service: Tax Hardship Center offers their tax relief services nationwide (licensed by the IRS as Power of Attorney for all 50 states). Variety of services: They offer a wide variety of tax relief services ranging from audits to unfiled tax returns and filing for IRS programs like Offer in Compromise (OIC) and Currently Not Collectable status. There is a lack of transparency online regarding details and pricing. This could be due to them providing a free case evaluation. Tax Hardship Center says that after conducting the free case evaluation, they can properly quote one for services. Their reasoning; "every case is unique by nature and it’s unfair to quote service fee’s before knowing the facts of each case." To find out more about their pricing and services, we recommend contacting Tax Hardship Center directly to speak to a tax professional and receive a free case evaluation. Yes, but it can be much more challenging to pursue it on your own. Tax relief services like Tax Hardship Center have knowledgeable and licensed agents who have years of training and education. The amount of time tax relief takes depends greatly on the complexity of your case, how quickly you can return documentation to your tax experts, and what kind of program you qualify for. You can contact Tax Hardship Center directly to speak to a professional and find out more.